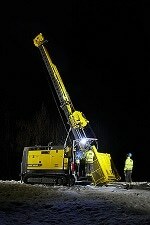 Atlas Copco has launched a new MEYCO mobile spraying unit designed for highly efficient shotcreting of mid-size tunnels. This unit, called MEYCO Versa, is the first Atlas Copco branded product to be launched on the market since the company acquired MEYCO in 2013. Atlas Copco MEYCO, the global specialist in concrete spraying equipment, has introduced MEYCO Versa – a new mobile unit designed to meet the present and future concrete spraying (shotcreting) needs of mid-size tunnel in hydro-power, road and rail projects. This is the first addition to the range since Atlas Copco acquired MEYCO of Switzerland in April last year and is based on a new design concept aimed at meeting demands for high productivity, ease of operation and reliability. The MEYCO Versa (as in “versatile”) is an all-in-one solution for concrete spraying designed for one operator. It has a new carrier platform with 4 x 4 crab steering, and is powered by a Tier 4 diesel engine. In addition, it has a new boom, an optional 75kW on-board compressor, a 20m3/h low pulsation concrete pump and a high-precision dosing system. Added to this is an intuitive user interface making the MEYCO Versa easy to understand and handle with all key functions carried out from the radio remote control. Bearing in mind that the unit is meant for one operator, the machine’s components have also been cleverly arranged to minimize setup and cleaning time. The MEYCO Versa will be available from Atlas Copco Customer Centers from November, 2014.